Omnis has been around for quite some time. Having started in 1999, hey are older and more established than most other hosts. Starting out as a Windows host they have expanded to offer Linux web hosting solutions as well as cloud hosting, web design, and domain registration. Their goal is to be an all inclusive hosting company, offering everything you need under one roof. While a bit more expensive than other hosts, Omnis offers something most other hosts do not include in their basic shared packages. 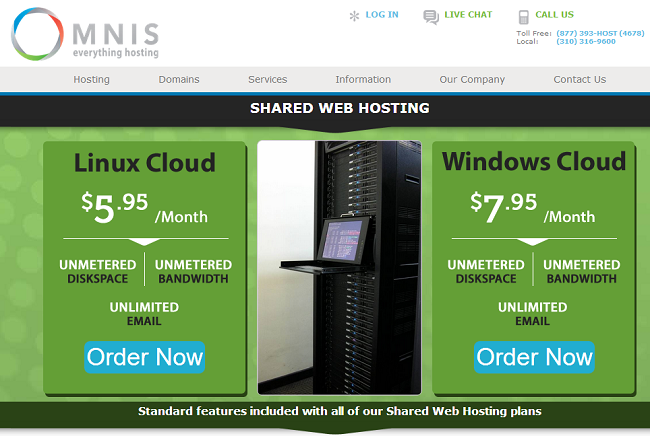 Every Omnis hosting account, both Linux and Windows, comes with cloud technology. Cloud hosting offers more reliability and better performance than you would get with a standard hosting package, meaning a more quality product for you. Omnis is a good hosting company. While they don’t offer an inexpensive plan that many beginners might be looking for, the added cost goes toward quality of service. The unfortunate thing for Omnis is that as hardware gets cheaper, it gets easier for budget hosts to offer a similar product at a lower cost. For beginners that are not looking for a more expensive, business class host, Omnis might not be the best choice. However, if your business relies on stability and reliability, Omnis is a great alternative. This review has focused a lot on price already, but Omnis is more expensive than most other shared hosts you will find. Their Linux hosting starts at $5.95/month and Windows starts at $7.95/month. In order to get the lowest prices you must purchase 2 years up front. Also included is a free domain name for the first year of registration. Since Omnis is an ICANN accredited registrar, they can offer domain renewals at a much cheaper rate than most other hosts. Where other hosts charge upwards of $15/year for renewals, Omnis only charges $8.95/year. 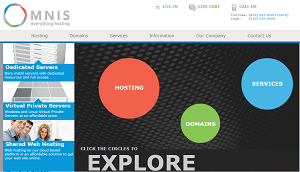 Omnis is another host that follows the “Unlimited disk space and bandwidth” policy. While other hosts have a list of limitations in their terms, the only limitation with Omnis is the total number of files that can be stored on an individual hosting account. The number of files that can be stored is a large enough number (81920) there there shouldn’t be any issues with storage. Omnis also includes SSD database storage which is especially helpful for websites that have a lot of database usage. This, more than anywhere else, is the reason why Omnis is more expensive than most other hosts. 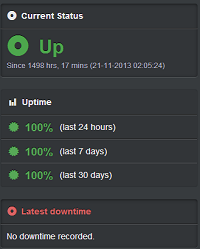 They do offer a 99.9% uptime guarantee, and my account with them beats that number. Over the last 2 months, in fact, my account has had no downtime at all. This, obviously, is especially important for business websites that rely on uptime and server stability to ensure that their website can be reached by customers at any time. I’m not sure if Omnis has a lot of turnover, but their support team is a bit hit-or-miss. Most of the times I will get someone who knows what they are doing and can help with anything I ask, but every once in a while I will get an employee who seems like they are either new or just don’t care to help. I’m willing to give them the benefit of the doubt because most of the time the support is just fine and I can understand that sometimes there will be employees who don’t quite know what they’re doing yet. In my opinion, Omnis is best suited for those of you who need business class hosting without wanting to shell out big money for a VPS or dedicated server. Their reliability and uptime is a benefit for websites that need to be up all the time and it does so at a cheaper cost than enterprise solutions.